When I moved to my town, I learned that my town had a fire station. I knew where the fire station was. In fact, the fire station was one of the navigational markers I gave friends when giving directions to my home…”If you pass the fire station, you’ve gone too far.” I attended a few Sunday morning breakfasts at the fire station. But, that was the extent of what I knew. It wasn’t until about 5 years ago when my elderly neighbor got sick that I realized the impact a fire station has on a community. My neighbor’s serious health issues necessitated several ambulance rides to the local hospital. My neighbor’s spouse and children spoke of the helpfulness and efficiency of the Howard County (Maryland) fire fighters and EMTs. Last week, I had the pleasure of attending a Howard County Department of Fire and Rescue Services (HCDFRS) event for bloggers. The event showcased not only Howard County’s (Maryland) fire fighting and EMS services, but also focused on some little-known rescue and recovery services. I was not familiar with HCDFRS’ preparedness when it comes to complex medical emergencies, accident scenes, water rescues, hazardous materials, and so much more through the use of Pod Power. 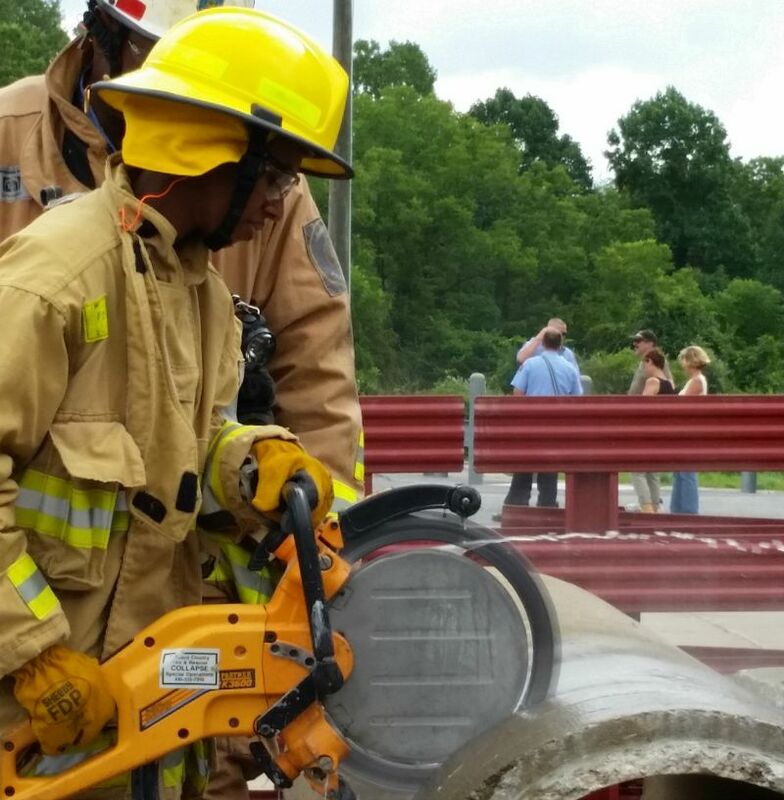 All the many aspects of HCDFRS’ Pod Power were demonstrated to bloggers at the James N. Robey Public Safety Training Center in Marriottsville, Maryland. I came away with SO much information that I want to share with you. It’s hard to know where to start! Let me start with the basics. What is a pod? 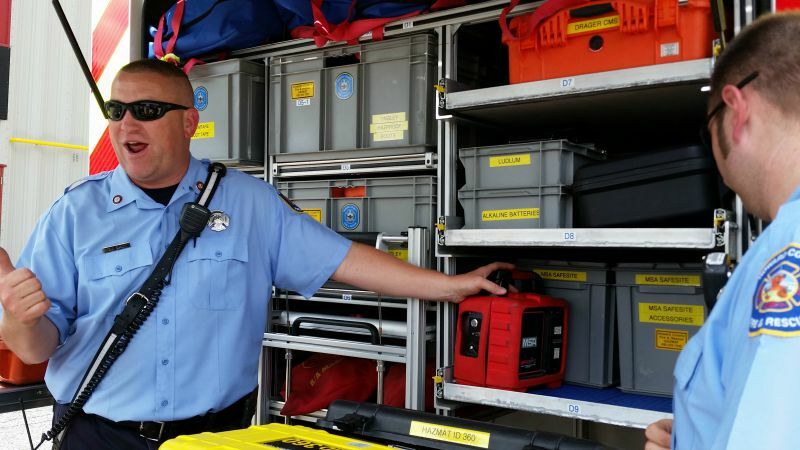 About two years ago, Howard County Department of Fire and Rescue Services wanted to streamline their response to handling major disasters and rescues. In the past, HCDFRS had used a single vehicle to transport all technical rescue and recovery equipment to disasters and accident scenes. These vehicles held equipment for all types of rescues: Hazmat Response, Collapse Rescue, Mass Casualty Emergency Response, and Emergency Shelter. These overloaded trailers were often dispatched to a rescue even if the rescue didn’t require every piece of equipment on the truck. 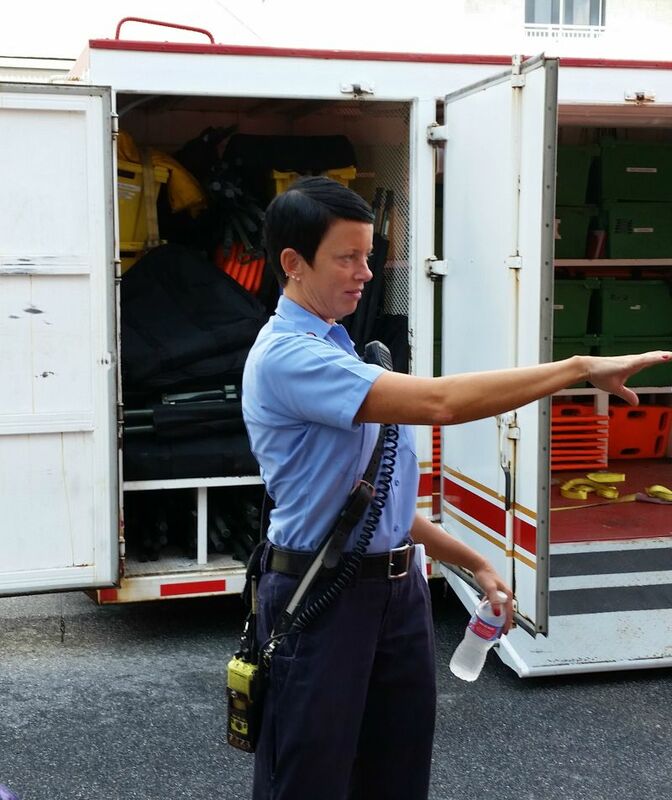 HCDFRS sought to streamline the disaster and rescue response process by outfitting Pods or trailers with the materials needed for a specific rescue or disaster. These Pods were outfitted individually with only the materials and equipment needed for a particular type of rescue. Each Pod is a mobile storage unit pulled by a Transporter Chassis Truck “equipped with a hydraulic hook-and-arm system that grabs the Pod.” Each Pod contains equipment that is neatly organized and stored in drawers, bins, and cubbies. HCDFRS firefighters and EMS workers can easily access equipment in these individualized Pods instead of sorting through a single trailer. 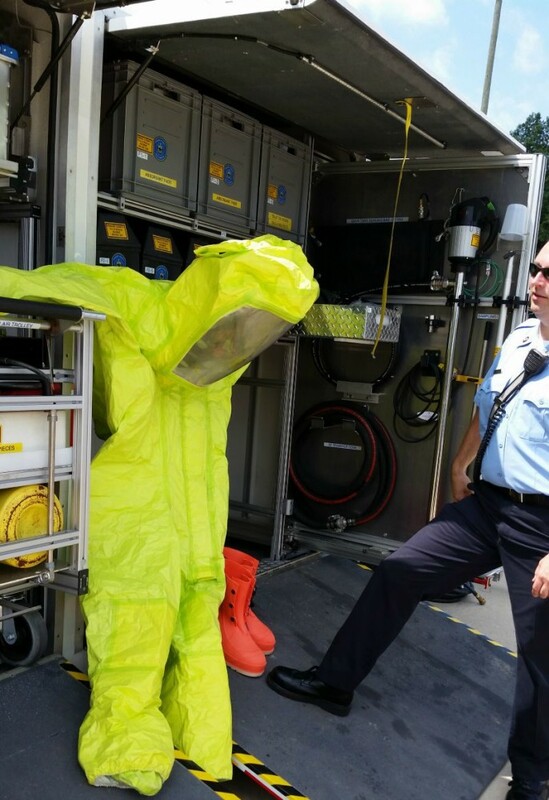 Hazmat Response Pod, featuring equipment and supplies to handle fires involving hazardous materials, incidents involving chemicals and biological agents, and train derailments. 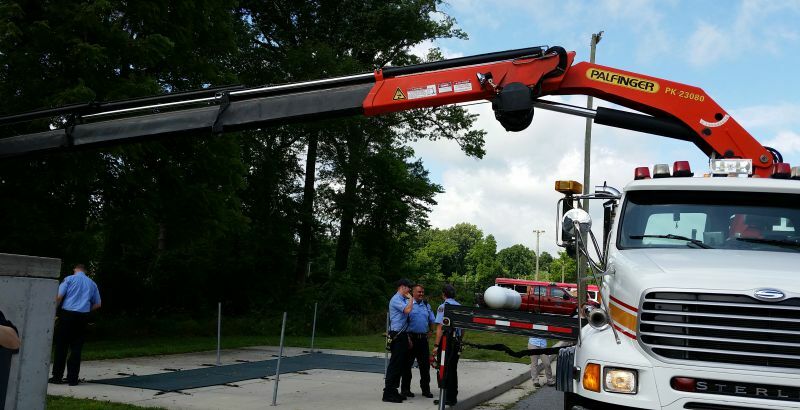 Collapse Rescue Pod, including a crane capable of lifting between 2,700 to 10,160 pounds; a hydraulic winch to pull trucks out of ditches and off highways; Trench/Building Collapse equipment; and Technical Rope supplies. These cranes have been used to move everything from concrete pipes to horses to overturned trucks. Mass Casualty Emergency Response Pod, including first aid supplies, oxygen therapy and spinal immobilization for up to 50 patients, and a John Deere All Terrain Vehicle. Emergency Shelter Pod, featuring emergency shelter supplies. such as wheelchairs, blankets, dried food, and water. The Emergency Shelter Pods are maintained jointly by HCDFRS and Howard County Citizen Services. 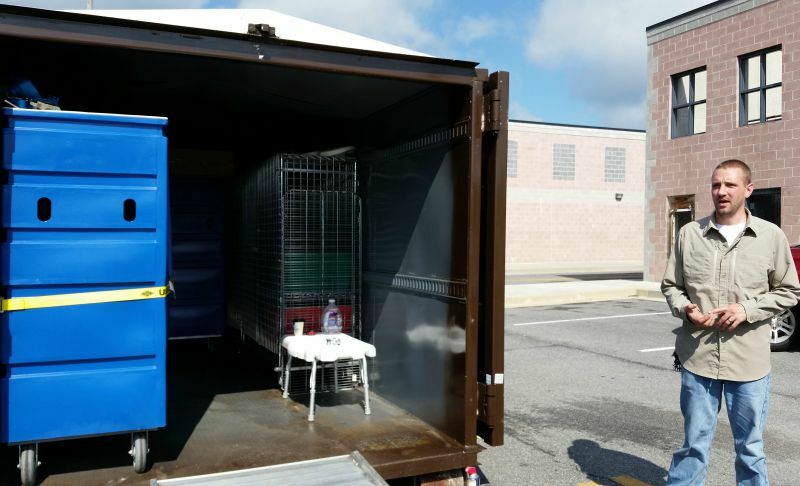 The Emergency Shelter Pods are moved to community centers and libraries in times of disaster for the use of the entire Howard County community. Visit the Howard County Department of Fire and Rescue website. Like the HCDFRS page on Facebook. Follow HCDFRS TV on YouTube.